The following grants are result of a six month process led by the members of our 2014 Environmental Justice Giving Project. 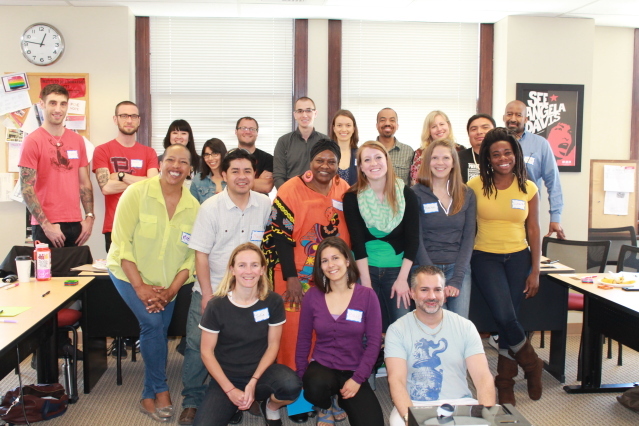 The 2014 Environmental Justice Giving Project consisted of 12 members from diverse backgrounds who worked together to learn about movement building, environmental justice, and the intersections between race and class. This group spent six months together learning, and leading a full grant cycle from beginning to end. They learned how to fundraise, how to review grants, reached out to 114 people from their own personal networks, and raised $46,368 to support the organizations below. Take a moment to read about our newest slate of grantees and the incredible work being done in the Northwest. Duwamish River Clean Up Coalition/Technology Advisory Group (DRCC/TAG) | Seattle, WA: DRCC/TAG is a community-led organization representing low-income and diverse residents, Tribes and fishing families affected by the Duwamish River Superfund site. In the next 2–3 years, EPA will make final decisions about the river cleanup and associated public health interventions. DRCC/TAG is working to represent the directly affected communities, particularly native Spanish and Vietnamese speakers in South Park and fishing community members from South Seattle and South King County to ensure the EPA’s accountability to, the communities directly affected by the Superfund site. Got Green | Seattle, WA: Got Green’s mission is to ensure that low income communities and communities of color in Seattle and South King County gain equal access to and reap the benefits of the green movement and green economy: green jobs, healthy food, energy efficient and healthy homes, and quality public transportation. They do this by cultivating community leaders to organize, educate, advocate and build coalitions. OPAL – ENVIRONMENTAL JUSTICE | Portland, OR: Bus Riders Unite (a project of OPAL) is the premier transit rider union in Oregon, working in Portland metro to empower transit-dependent riders to raise their collective voices to influence transportation decision-making to ensure equitable outcomes. This grant provides resources to support continued leadership development, assisting with community education, organizing, and mobilization to build power for transit justice and civil rights. Community to Community Development | Bellingham, WA: Community to Community Development (C2C) is a place based, women-led grassroots organization working for a just society and healthy communities. They are committed to systemic change and to creating strategic alliances that strengthen local and global movements towards social, economic and environmental justice. C2C prioritizes the analysis of women of color, and the actions and solutions proposed by the most directly-affected immigrant, farmworker, low-wage worker, youth, LGBTQ communities in rural Whatcom and Skagit counties. They cultivate deep solidarity relationships with sister organizations through larger regional, national and global coalitions that move social, economic, environmental, racial, and gender justice forward. Indian People’s Action | Butte, MT: Indian People’s Action (IPA) mission is to work in Montana urban areas, border towns of several Indian reservations to organize for social, economic and racial justice. IPA is deliberate through its training and listening sessions to cross the boundaries of race and class among those participating. Social Justice Fund Northwest supports organizations that are community based and that use community organizing to achieve their goals. Our grantees are led by people from the communities most impacted by injustice and inequality, and are engaging in some of the most effective community organizing in our region. Our Environmental Justice Grant Cycle supports organizations that: strive for equitable access to a clean and healthy environment; work for sustainability, including racial and economic justice; and are community-based and led by the people who are most disproportionately affected by environmental justice issues.